[PDF] What is this thing called Metaphysics? | Free eBooks Download - EBOOKEE! [PDF] What is this thing called Metaphysics? Description: Why is there something rather than nothing? Does God exist? Who am I? Metaphysics is concerned with ourselves and reality, and the most fundamental questions regarding existence. This clear and accessible introduction covers the central topics in Metaphysics in a concise but comprehensive way. 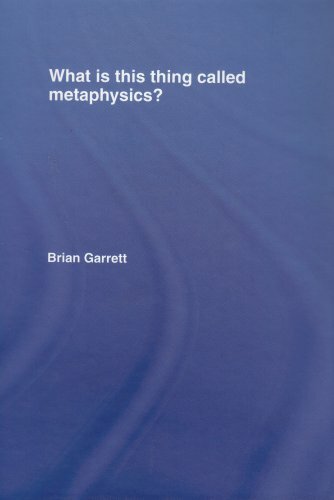 Brian Garrett discusses the crucial concepts in a highly readable manner, easing the reader in with a look at some important philosophical problems. He addresses key areas of metaphysics: existence causation God time universals personal identity truth What is this thing called Metaphysics? contains many helpful student-friendly features. Each chapter concludes with a useful summary of the main ideas discussed, a glossary of important terms, study questions, annotated further reading, and a guide to web resources. Text-boxes provide bite-sized summaries of key concepts and major philosophers, and clear and interesting examples are used throughout. No comments for "[PDF] What is this thing called Metaphysics? ".